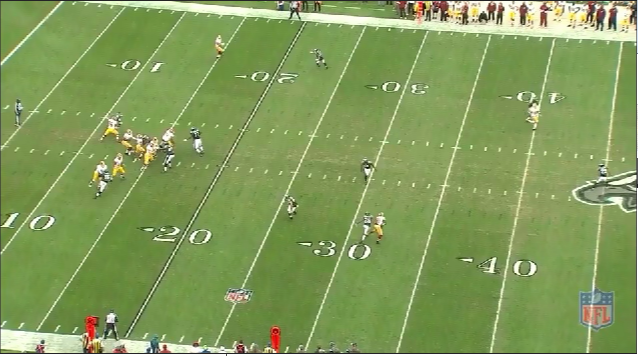 Again, he's throwing more but is noticeably worse in almost every rate statistic, and this is with Pierre Garcon at receiver. His interception ratio was never going to stay as low as 1.3% - anything below 2% is elite, and he's not elite, yet (2010 Josh Freeman also had a very low interception % which may have portend tougher experiences for him as well). Most concerning that both yards/attempt and completion percentage have plummeted. 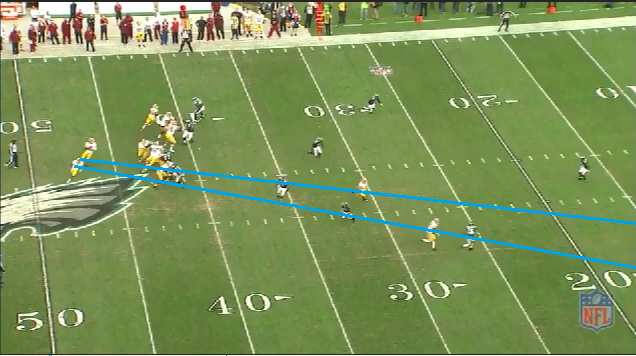 These usually move in opposite directions as deeper throws are harder to complete but increase yardage/throw. The reverse is often also true: Tom Brady may not have a high yards/attempt figure but completes an insane amount of short passes. Let's turn to the tape and try to find evidence of his regression. One popular theory this season is that he's not completely healthy and that has held him back as a thrower (not stepping into throws) and runner. I'll watch especially for that, as well as for the other fundamental factors I've been noting. As always, conclusion at the end. 1. His first pass is a debacle. 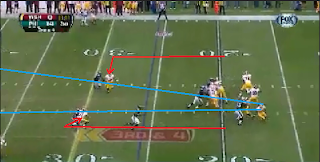 A go route on the left is doubled by the safety, a linebacker is shading the back in the flat closely on that side. 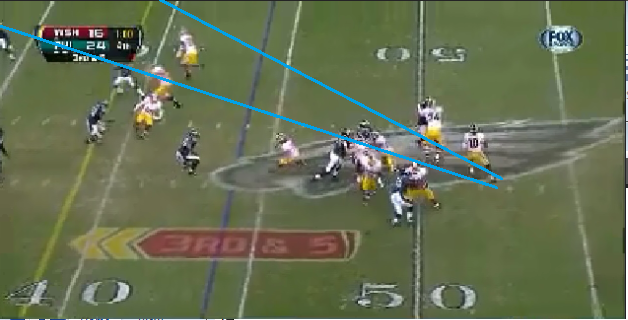 A 15-yard dig on the right side is covered well with linebackers underneath. 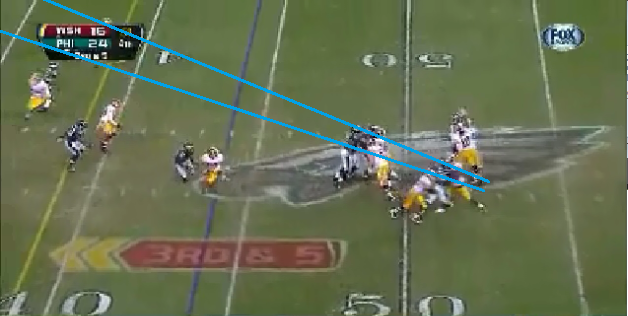 He is pressured to his right, where at the last moment he tries to throw a rope to a double-covered receiver. 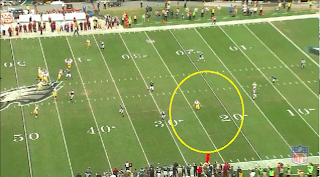 By the time the throw gets there, the receiver is out of bounds (who knows why) and the ball was almost intercepted. 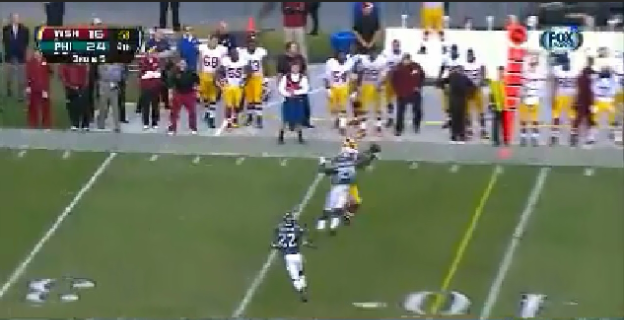 This was a dangerous pass that should have been thrown away. 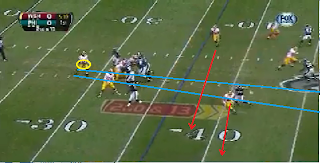 2: A go route on the right outside clears the safety while the slot receiver runs an out. 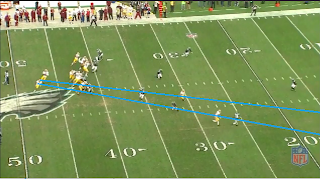 RG3 does a great job turning his hips to that side after initially having them point straight downfield, but unfortunately, puts too much zip on the ball and it flies 3 yards over the head of his receiver. 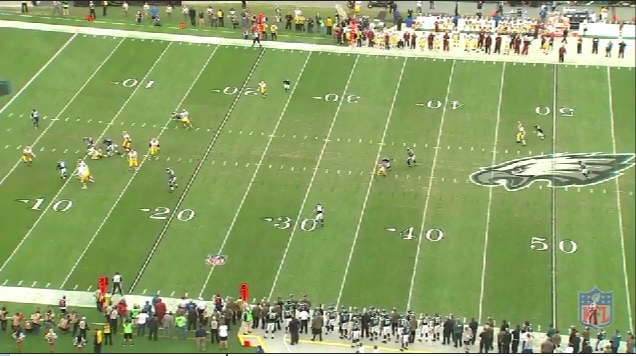 His man had found a huge hole in the zone, so this pass could have been lofted in - that may reduce YAC (yards after catch) but increases the likelihood the pass is completed. 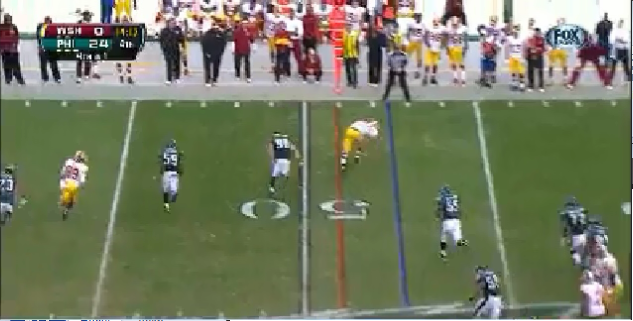 Griffin is generally good at touch pases but just misses here. 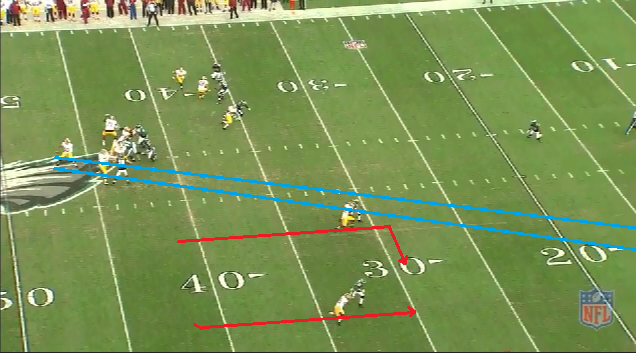 3: The Redskins try the same route concept as the second pass. This time the coverage is better on the out. 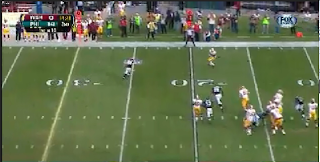 Again, RG3 does a good job turning his hips, but the pass was batted at the line. 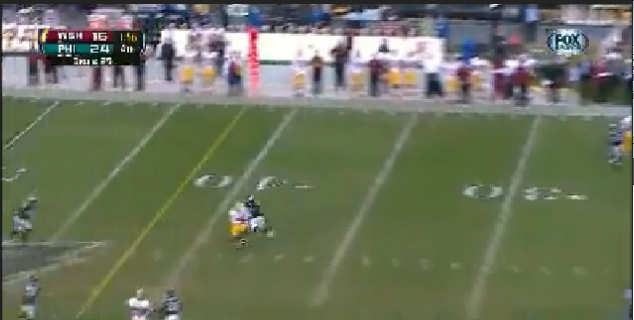 Not sure which receiver he was going to. 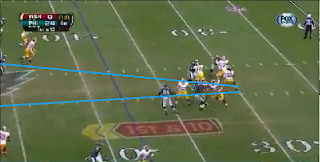 4: This looks like Cover-1 man underneath, and the left post is open as I've circled. 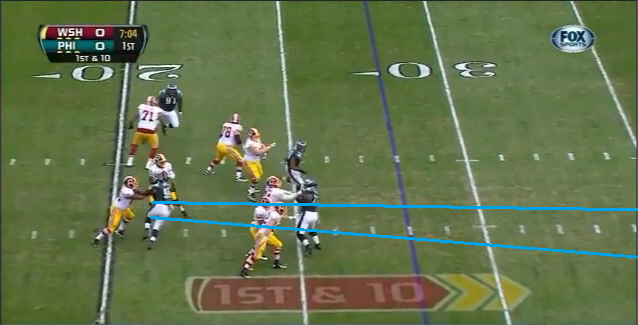 Good QBs have to hit this between the linebackers. 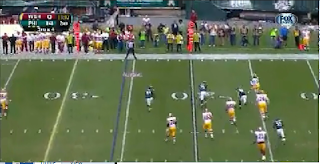 RG3 hesitates, death for most guys, but he actually gets all the linebackers to turn their backs, giving him a 14 yard scramble up the middle. 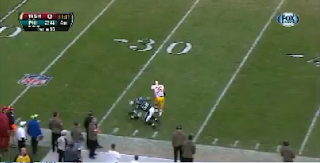 Not many players can make up for a bad decision with their legs, and by doing so, Griffin shows that his knee may not be as bad as people pretend. 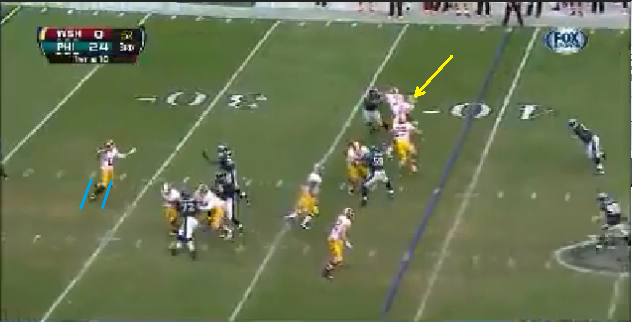 5: Doesn't like what's downfield so rolls to his right and settles for a 3 yard scramble. He was 11 yards behind the line before he really took off, so it's still impressive. 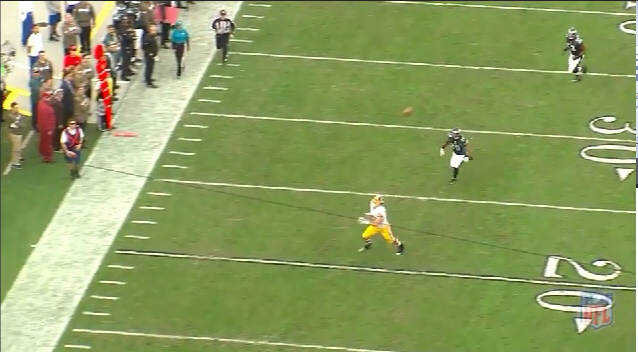 I like how he keeps both hands on the ball and hold it high as he's running to the sideline. 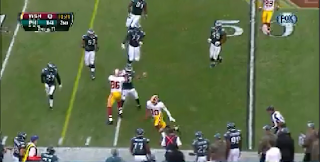 This is great form - quick to throw and less likely to be stripped. 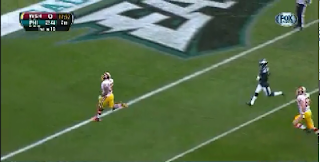 Cam Newton could learn a thing or two from this guy. 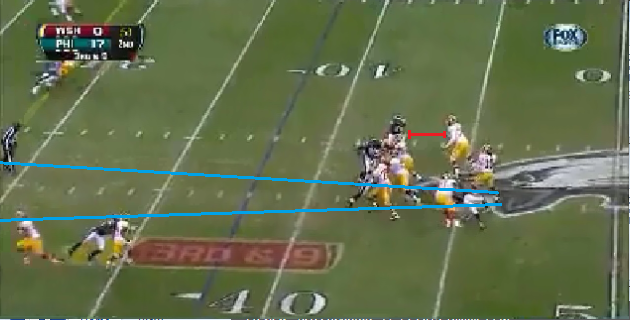 6: Two drags route from left to right are both reasonably open but Griffin hesitates and is sacked. 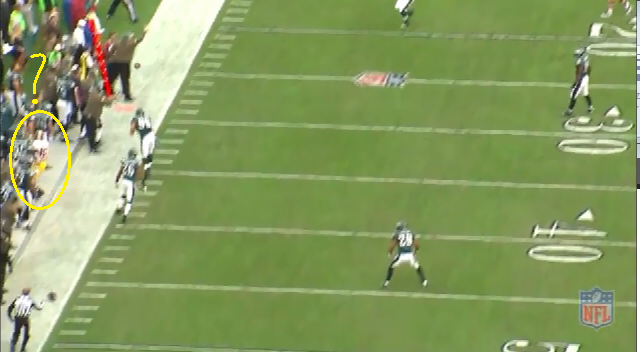 I don't like how low he's holding the ball here - makes the throwing motion longer and increase the likelihood of a strip. 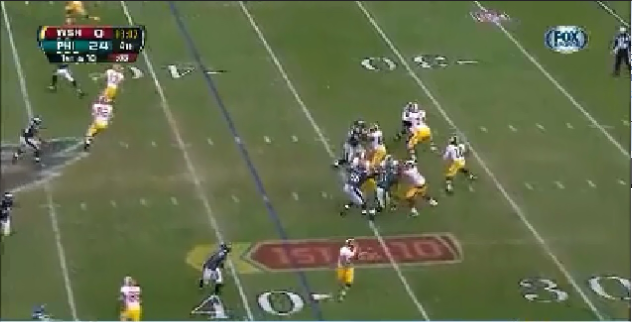 7: They called this screen to the right immediately after the sack, which I love. 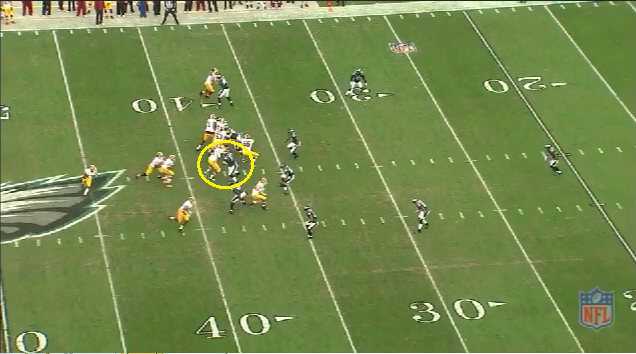 Sacks show aggressive rushing by the defense, and screens take advantage of that. 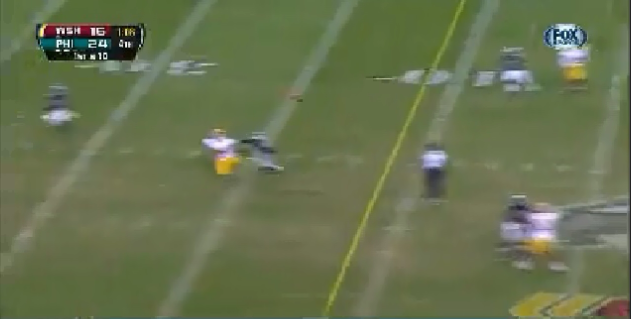 This was almost a 1st down. 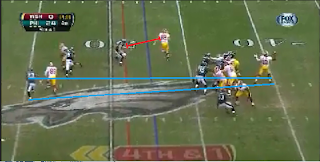 8: Again, great hips, this time firing on-time to a skinny post but the well-thrown ball is dropped by the receiver. 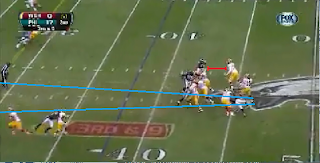 9: Doesn't like his reads so throws a checkdown to the RB for 5 yards. 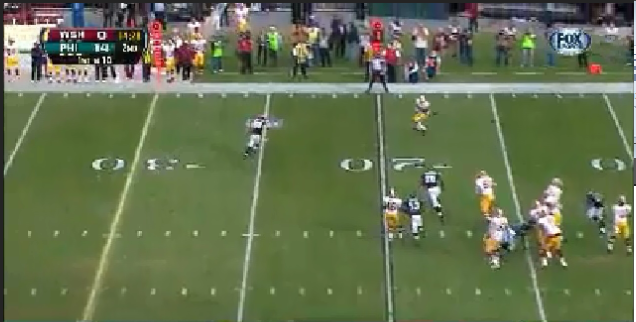 Alfred Morris isn't known as a great pass catcher, and I don't see why he can't be. 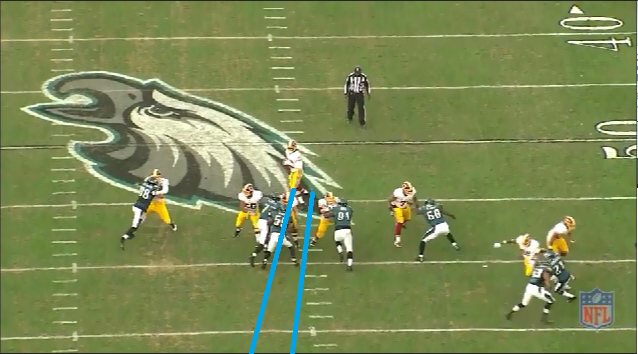 The 'Skins need to utilize their short passing game more. 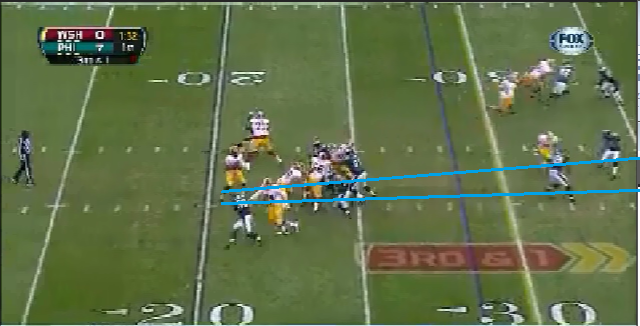 No shame in 5 yards on a checkdown, that is successful yardage on 1st and 10. 10: This pass should dispel any remaining notion that RG3's knee isn't right or that he doesn't trust it. 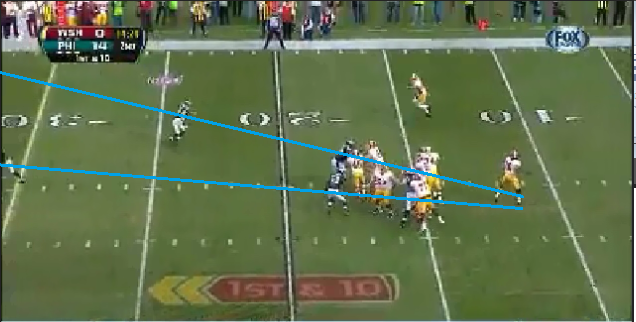 A dig and curl converge on the middle of the field (not too sure about the route design). Griffin is flushed from the pocket and after some initial looseness, again gets both hands on the ball and holds high. 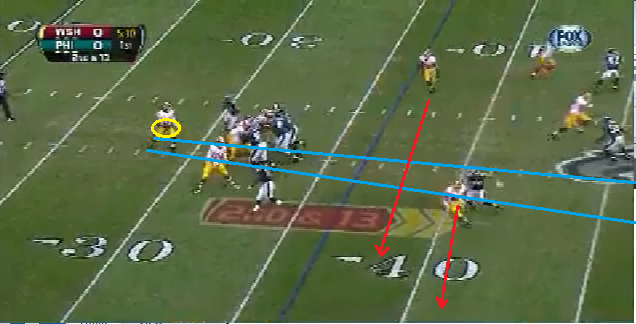 While sprinting, he throws a dart to a receiver that had worked to the sideline. 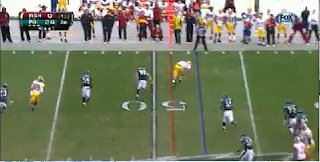 This is a perfectly placed rope of a throw - look how well the receiver was covered and how he barely gets both feet inbounds. 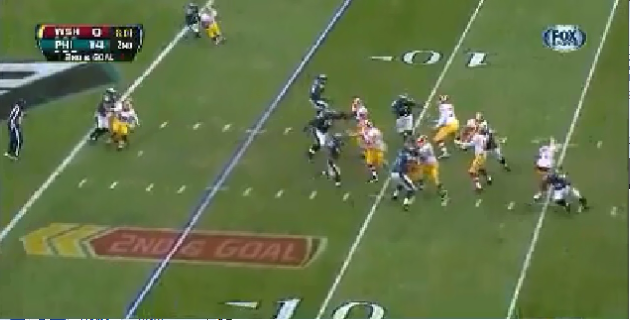 This was a big boy throw for 15 yards. 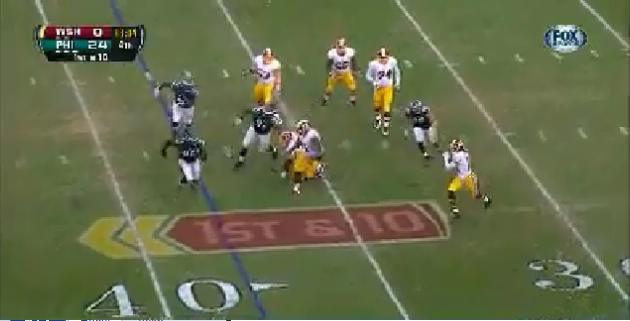 11: In trouble, RG3 somehow escapes the pocket to the left but is only able to get 8 yards on 3rd and 10. 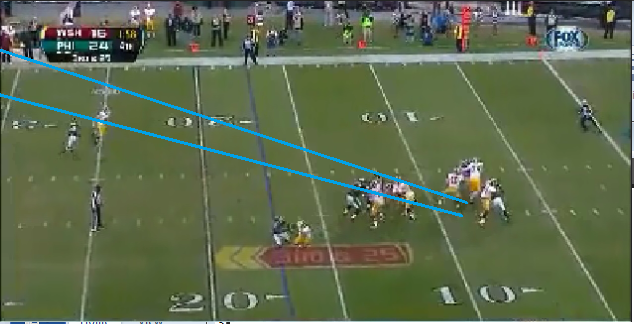 12: Designed roll to the right, throws over a defender. 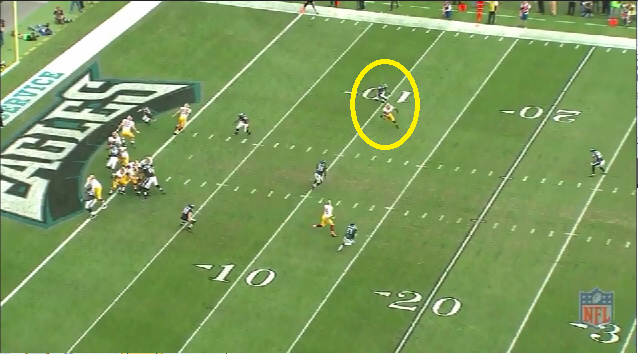 The on-time throw gives his receiver room to run 11 yards after the catch. 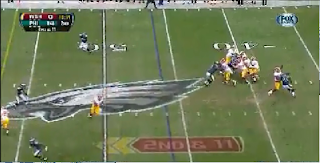 13: Opens his hips a little here, but if he's going to the far corner of the end zone, that's actually ok - you want to throw away from a defender as a pick here kills. The problem is he waits too long for the play to develop, allowing the rush to get him. This would be a theme of the afternoon. 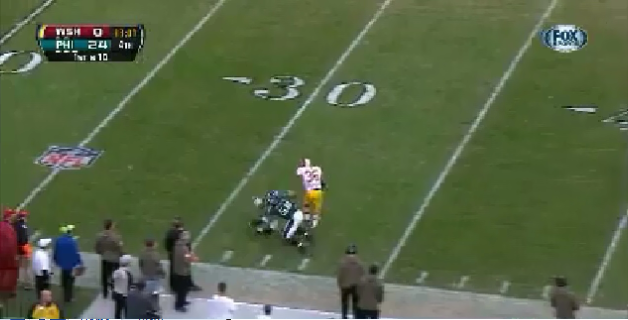 A batted ball leads to an interception. 14 was the last shot of the first half. 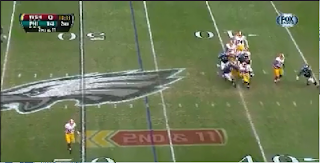 As mentioned, I will only post certain interesting shots of second half passes for brevity, though will discuss all of them. 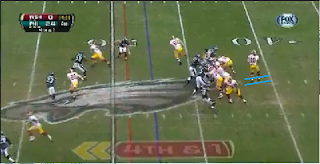 22: Here's an interesting one: This screen play was a good call - look how far the three Eagles rushers are upfield. 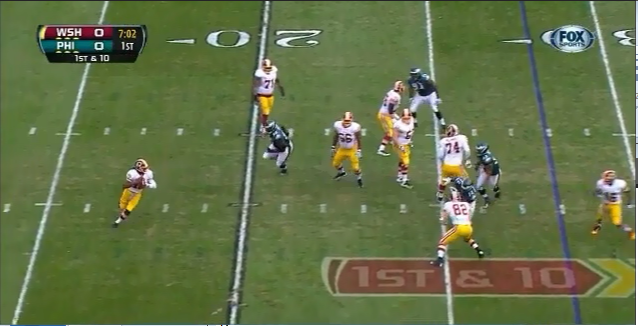 Problem is right defensive end has read the play and is making the throw tough. Griffin doesn't make it easier by opening his hips completely. 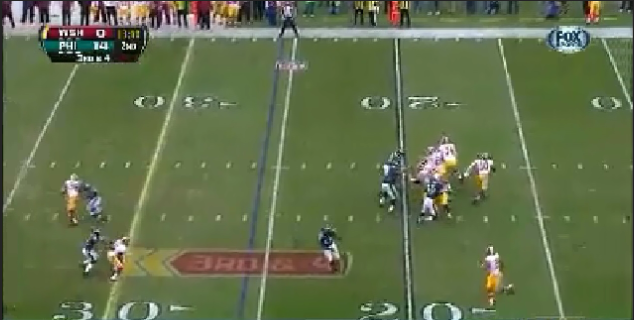 The throw is off target and very close to being intercepted. 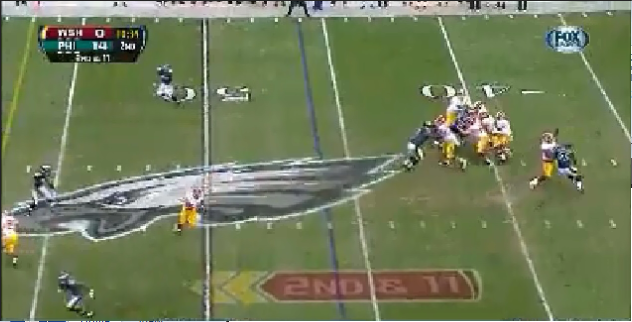 23: Another good play call, especially to go for it on 4th and 1.5 yards. 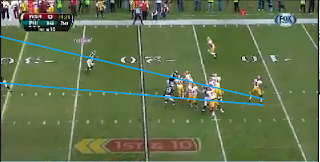 They faked the inside zone, and Griffin does a fantastic job selling the fake - look how open his man is. 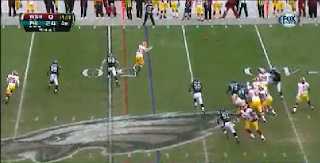 He doesn't have time to get his feet lined up after the fake on this pass to a man motioning to the right flat, but still puts the ball right on the money - just look where the receiver is reaching for the ball. 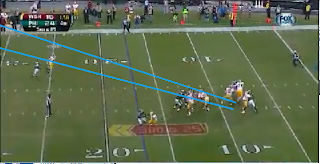 Unfortunately the pass was dropped on what should have been an easy conversion. 24: Another great throw on the run. 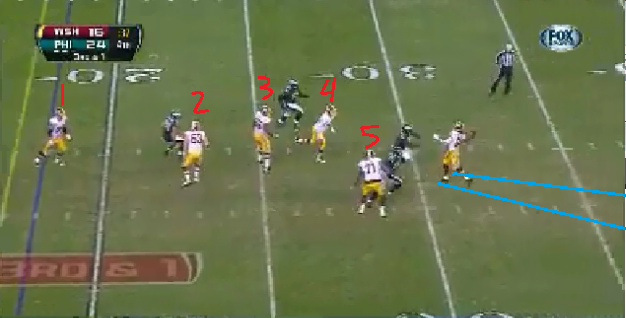 This is another slow-developing play. 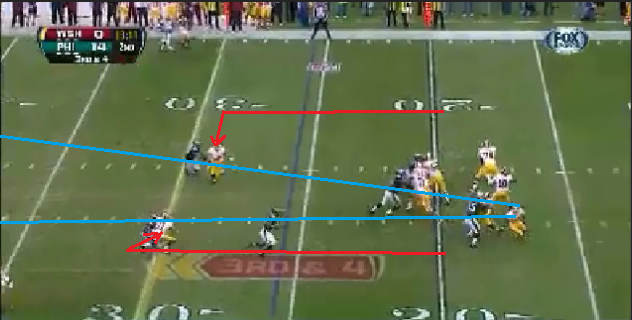 I don't know why they call so many deep routes, even down 24 points. 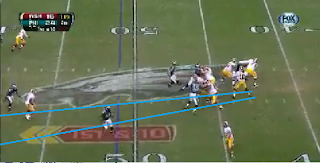 Griffin looks accurate and sharp on the short stuff, but whether it's him or the offensive coordinator wanting to go deep, I don't think this will always work for them. The good news? When he's in trouble, he's still RG3. 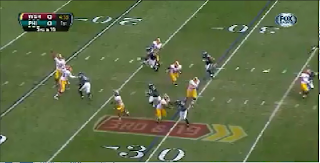 I don't know how he escaped the pocket - he jukes right, then sprints left and throws a dart to a receiver that squeezes between two tacklers and waltzes into the end zone. The question with this play is: Is Grffin's ability to use his athleticism to escape the pocket and make these kinds of throws worth the times he waits and waits and then is sacked? More on this later. 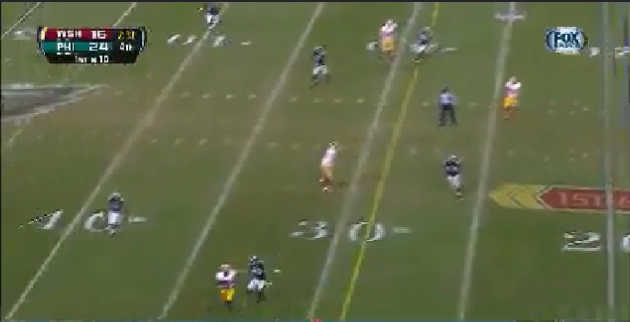 28: Great throw on an out route. 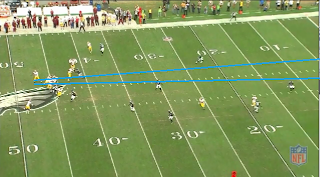 He recognizes the very soft coverage and how with a throw to the back shoulder, can get the receiver turned to face downfield, resulting in 15 YAC. 29: Unfortunately I did not get this one and should have. 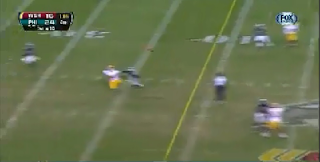 It was a play action roll to the right, ball was underthrown but the receiver beat the DB so bad he had time to come back and still grab it for a TD. 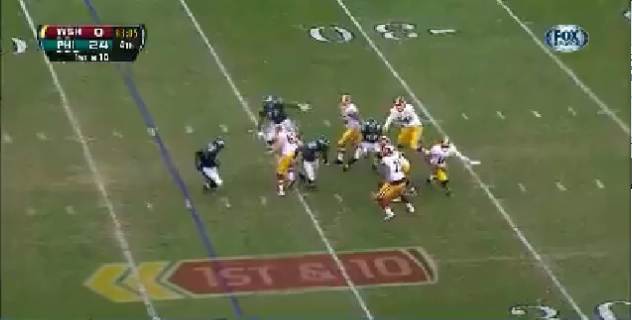 30: Great throw on a curl. 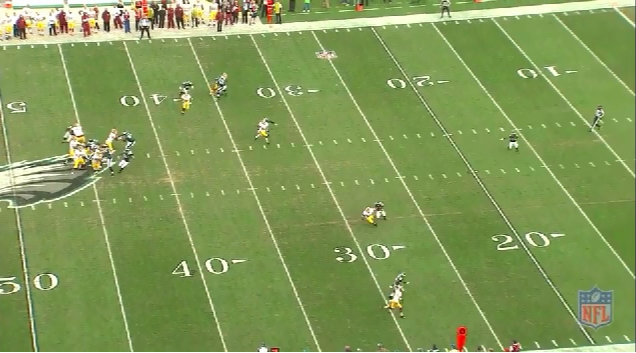 Feet pointed correctly, recognizes solid coverage and the need to lead the receiver backwards away from the tackler. 31: Nobody is open; hips are opened and the pass is sailed to a well-covered receiver running to the left sideline. I wrote this down as a throwaway. 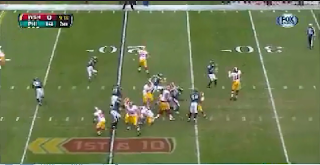 32: Good throw on a 14 yard comeback against soft coverage. 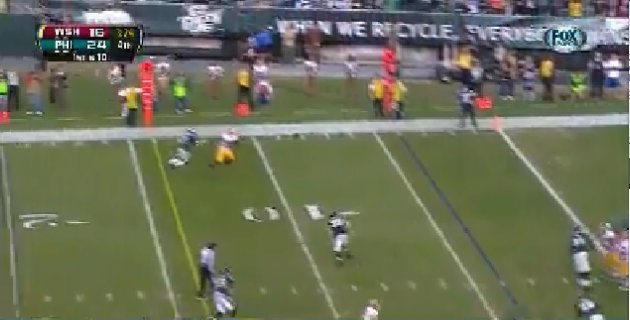 33: Deep throw on a go, missed out of bounds by 1 yard. 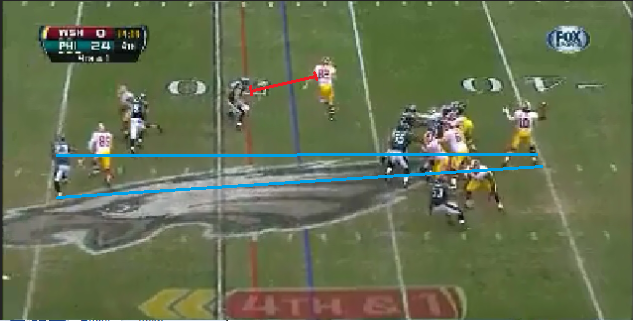 34: Escaped pocket, threw across the grain and high, incomplete. 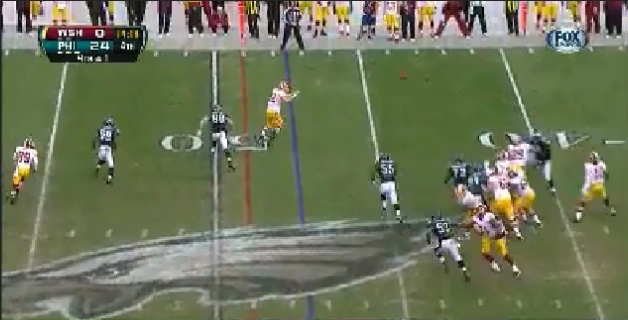 35: Again, good coverage so Griffin sails a deep corner route high. He understands that he cannot take another sack. 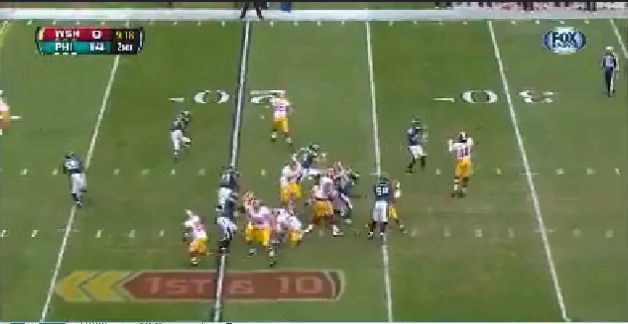 36: Another fantastic throw. 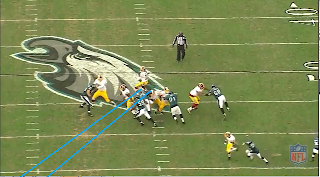 Correctly steps up in the pocket against heavy pressure, allowing speed guys to go right around him. Gets his feet pointed reasonably downfield and gets the conversion to the post on a 3rd and 26. 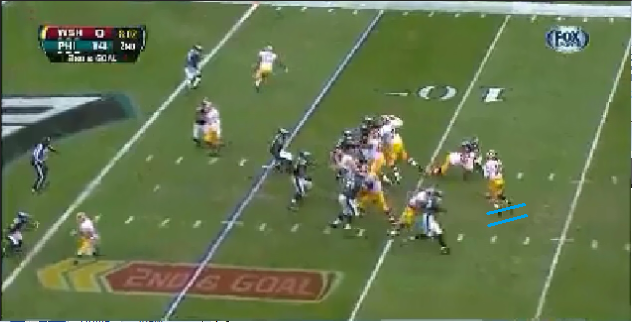 37: Scrambled left, threw over a well covered receiver. Looked like a throwaway. 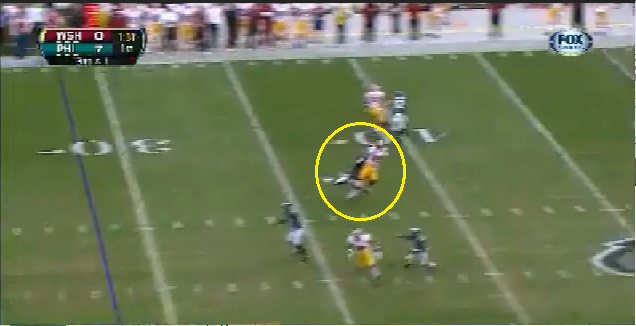 38: Dangerous pass to an out route where the DB jumped the route. 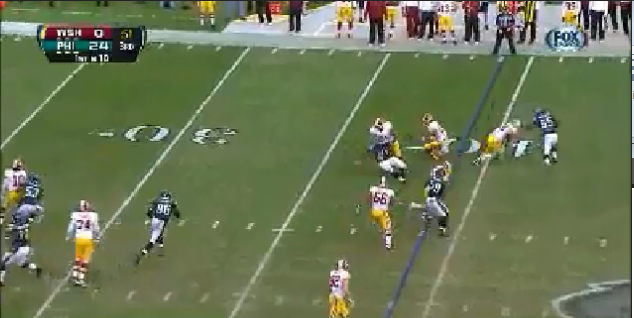 39: Everything covered, scrambled 2 yards to the left. 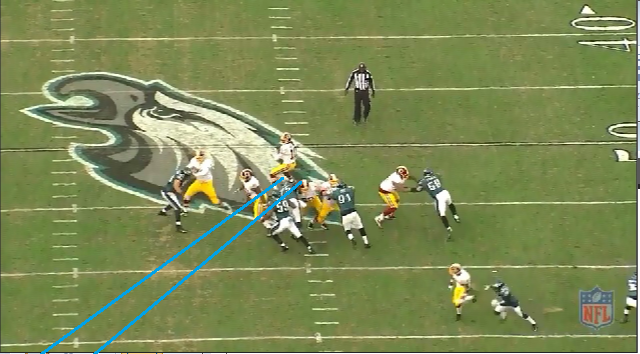 The Washington offense needs to take more advantage of underneath routes against soft coverage. 40: He is trying to throw a seam to a well-covered receiver - this is a tough throw that he must drop in the perfect location, but his hips are pointed slightly to the left and the ball sails just that much. 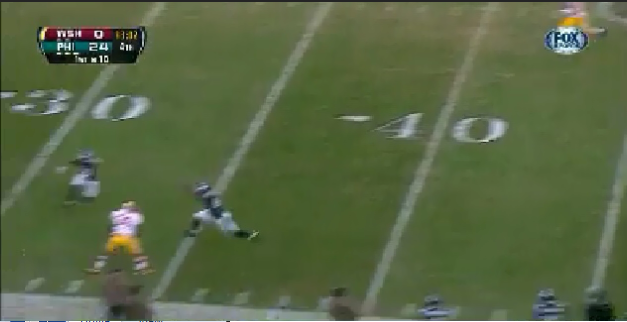 He holds his hands up in disgust (more on this later), but this incompletion is on him. 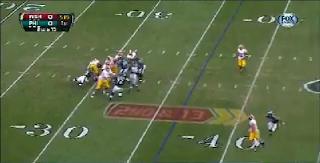 42: Nicely thrown deep out over the coverage playing a shallow zone. 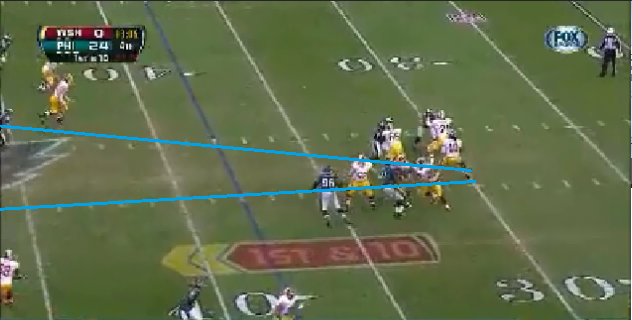 Hips are zeroed in and ball placement is right on the money. 43: Scramble left, threw high, incomplete. 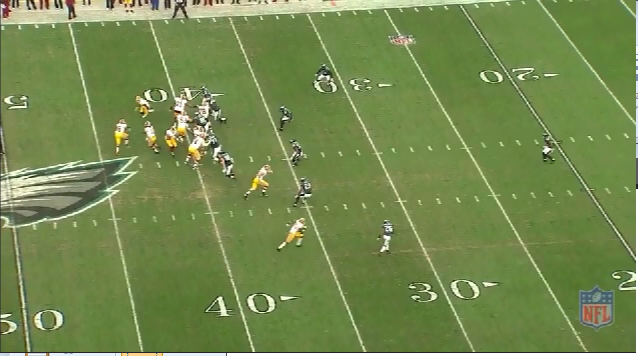 44: Dig route complete for 9 yards, short of first down. 45: Finally, the last pass of the day. 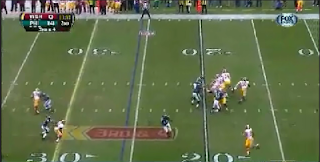 First, there's 12 seconds left, enough time for at least three plays (maybe four). 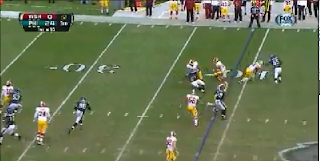 You know Philly's going to drop deep, and I think Washington has enough time to pick up 5-10 yards and a 1st down get out of bounds. 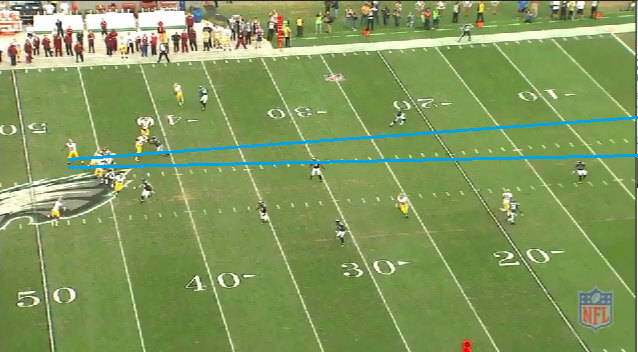 That gives you two shots at the end zone from the 10-15 yard line, which is certainly make-able. 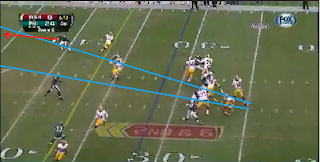 Instead, the staff calls for all routes to the end zone. 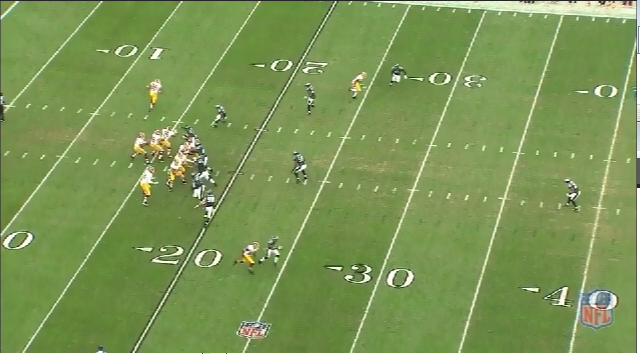 RG3 sprints backwards to buy time and ends at the 30 yard line, a full 13 yards behind the original line of scrimmage. Look at all the offensive linemen standing around. 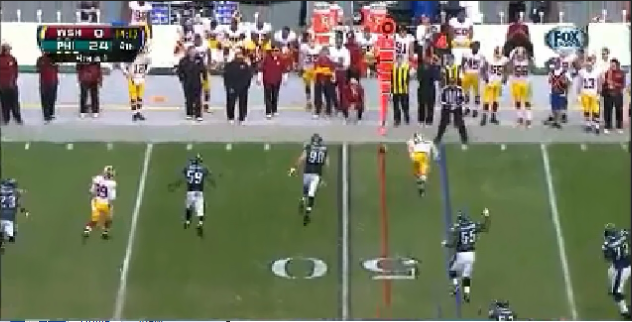 They know the play was to go deep, why have they all given up like the ball was thrown already? I count 5 guys standing around not doing anything. 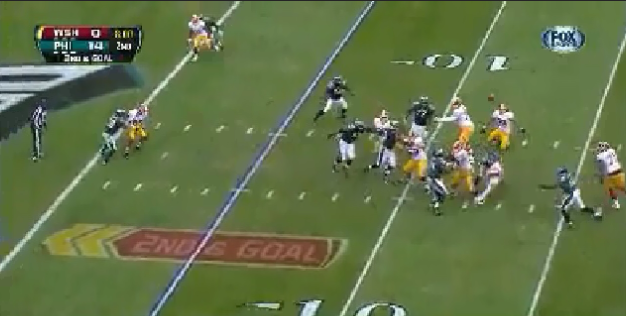 RG3 had absolutely no time to set his feet and really should have thrown the ball away. 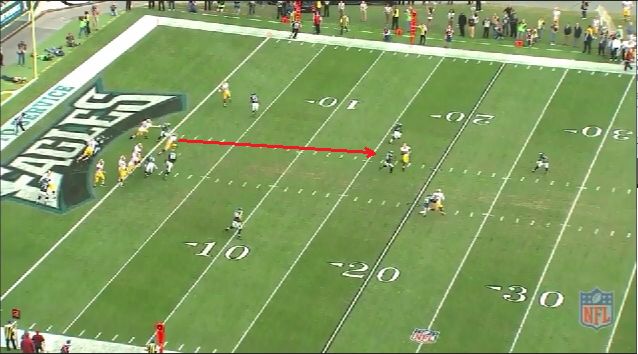 Instead he heaves it to no one in particular and it is easily intercepted in the end zone. 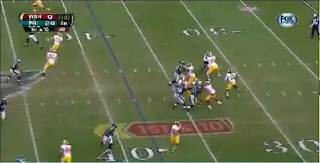 Tremendous Arm Talent: Like Cam Newton, Griffin has the ability to complete passes few QBs will even attempt. But he shows even more touch on difficult passes than Cam with an advanced ability to put some air on the ball and throw over defenders. Athleticism: Along with his big-play rushing ability, Griffin extends passing plays with his feet. A few first downs out of nowhere can really turn a game. 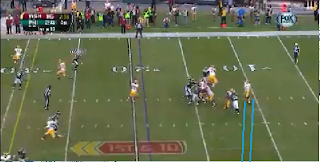 Strong fundamentals: In 45 called passes, I noticed only three instances where Robert clearly opened his hips and sailed throws (including the last desperation throw). 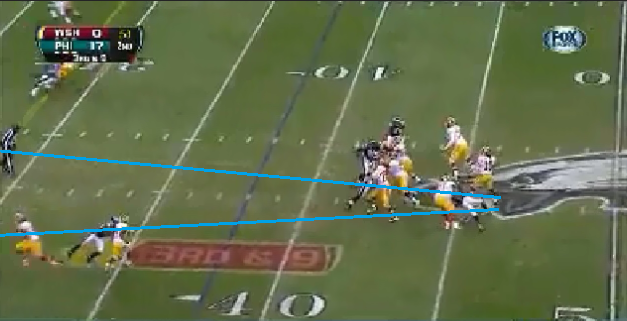 His posture and form are tighter than other young QBs, and on scrambles and rollouts, he is less prone to looseness with the ball. 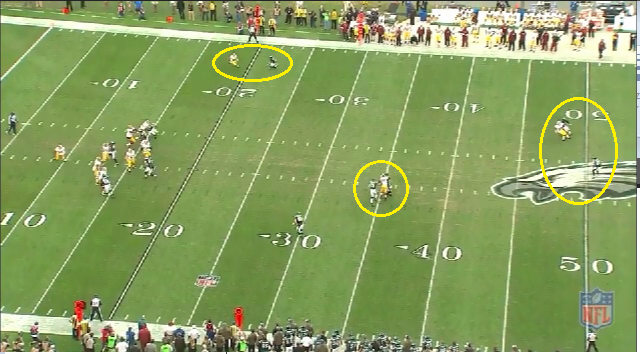 Finally, his fundamentals allow him to place balls in good places, or as broadcasters call it, throwing receivers open. Sacks: His offensive line played poorly, but many of the sacks he took in this game were because he waited around in the pocket for something to happen. 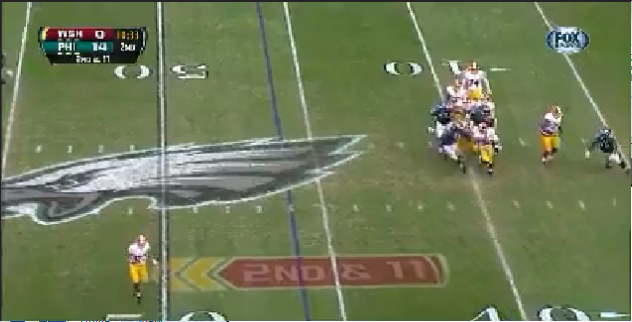 He seems supremely confident in his ability to hit any pass and/or get out of the pocket if it collapses, but this isn't a college defense he's playing. 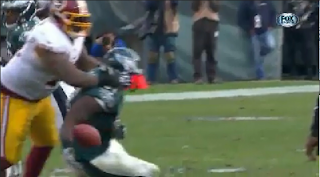 Holding on to the ball doesn't work even for the most athletic of quarterbacks. 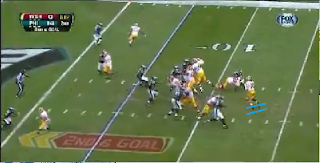 Just look at Michael Vick. 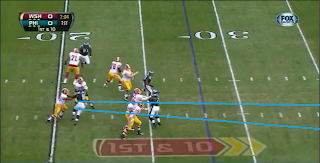 As the game progressed and Philly's lead became more daunting, Griffin got smarter with the ball and dumped it off more when the coverage downfield was good. 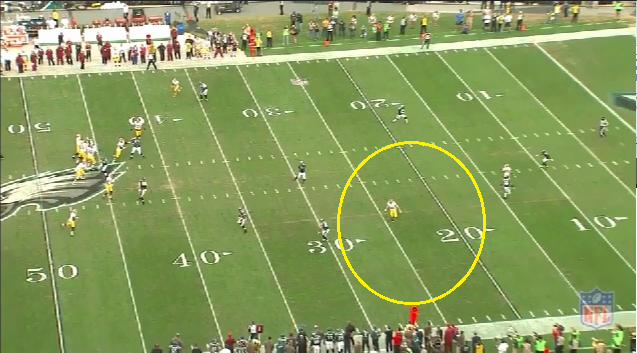 But he needs to do this throughout the game so teams don't get those big leads. 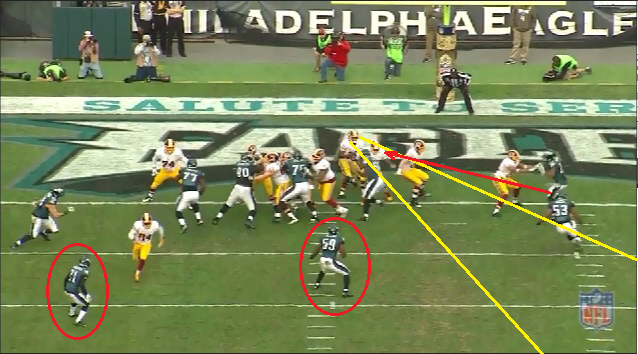 Recognition of Coverage: This is related to not taking so many sacks. 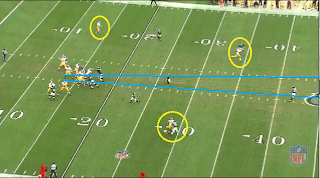 For the most part, Griffin showed a good ability to distinguish coverage types and where the ball needed to go. 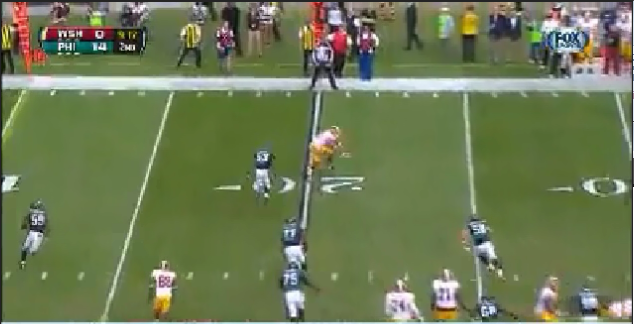 But he needs to be quicker and more decisive with his reads or throw the ball away. 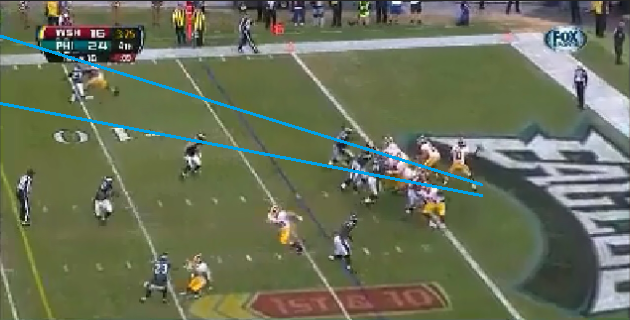 In some cases, you could see he understood that the deep coverage was good, but still tried to throw deep anyway. 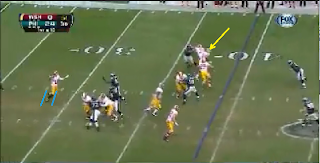 Again, because he has the ability to make some of these throws doesn't mean he can try them each time. 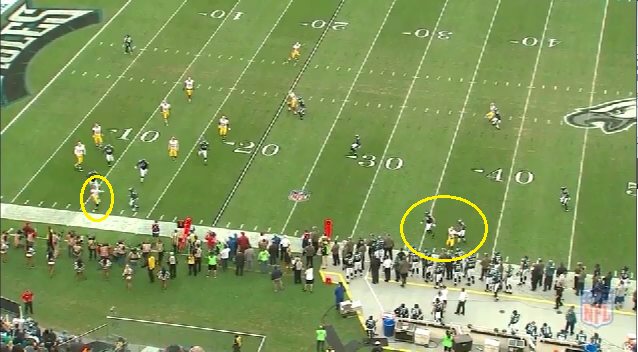 Body Language: I highlighted one example, but he threw up his hands a few times after plays weren't made. Yeah, Brady, Eli, Peyton, they all do that. 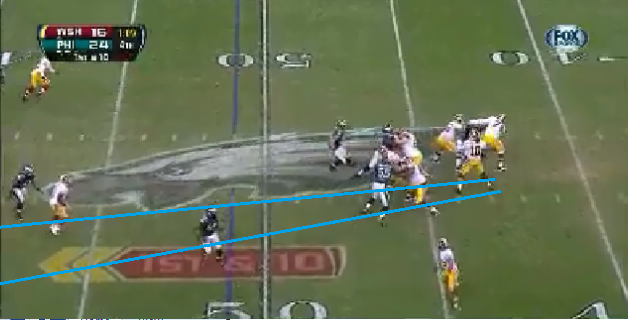 But Griffin is a second year QB with a lot to learn. 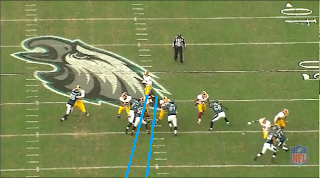 Consistency: RG3 has a good foundation but he was inexplicably loose on a few passes. 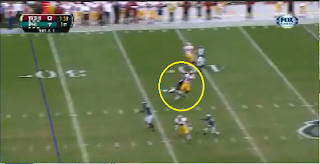 Elite QBs don't miss receivers like Griffin does on his second pass. This is a small sample but Griffin seems a little rattled by a long season of losing and big hits. 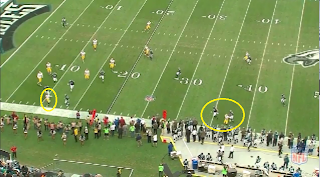 This is purely conjecture since I'm not seeing him practice or call plays in the huddle, but I've seen Griffin play much better than he did today. 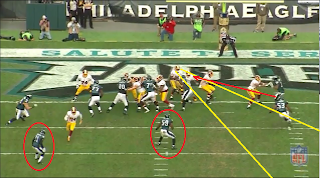 The Philly defense is going to blow up a zone read here. 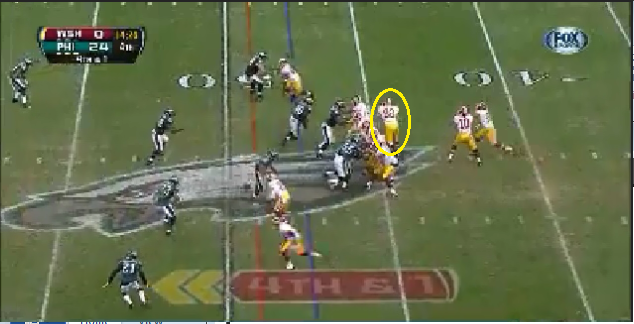 The defensive tackle has complete control over the right guard and stops the fullback in his tracks. 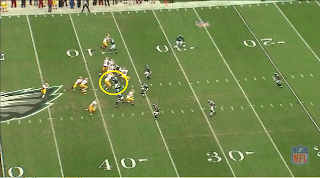 Of 45 called passes, I counted 17 cases where the defense sacked the QB, forced a scramble from the pocket, or pressured the throw. That is unacceptable. The Skill Position Guys: This is a bad team. 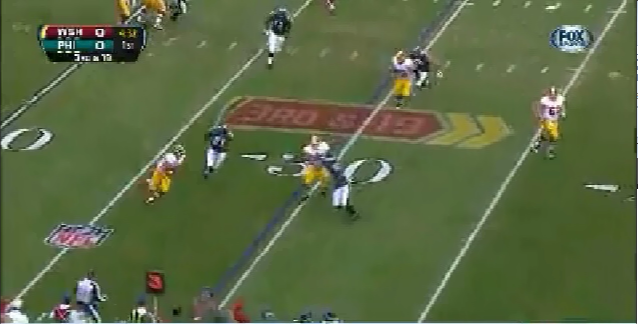 Alfred Morris is good. But the receivers were terrible in this game. 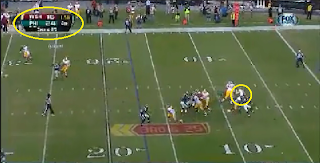 Nobody got open. The bad news is with Washington's cap limitations and all those picks they gave up for Griffin, these guys aren't getting better anytime soon. The Coaching Staff: Shanahan and Co. should be fired. They seem fine with calling long drops and deep routes when their QB is taking a beating. 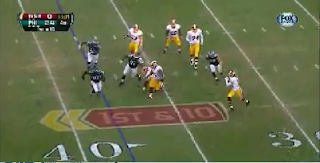 A lot of these sacks are on them, for not giving Griffin enough options underneath until it was too late. The other thing: it seems they run a very loose ship. 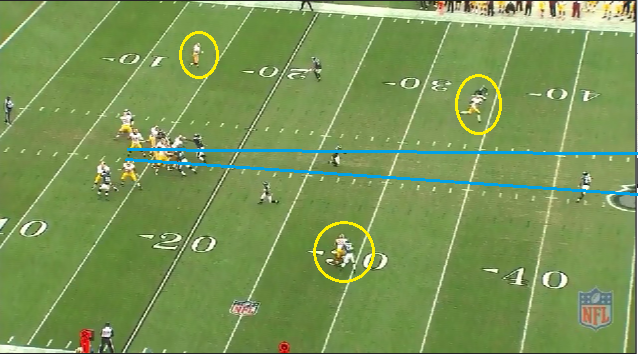 Receivers gave up on routes, linemen gave up on blocks, and they just don't seem like a focused and professional bunch. 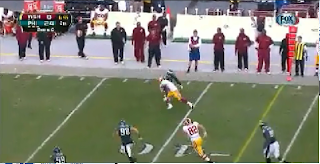 There's nothing wrong with being a player's coach, but it seems like Shanahan has lost control. Finally, I said I would watch specifically to see if Griffin looked healthy. And he didn't. But not because of the knee, because the knee looked fine. 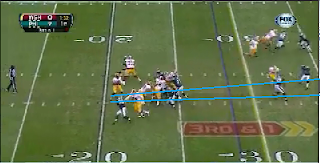 He did a great job of aligning his feet and pushing off, driving throws when needed. 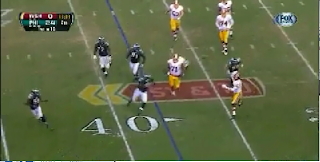 And when he needed to run, boy was he special. 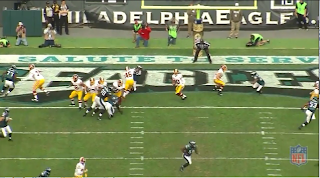 When throwing on the run, right handed throwers plant the right foot only, putting all the torque on that reconstructed ACL; Griffin did so with ease. 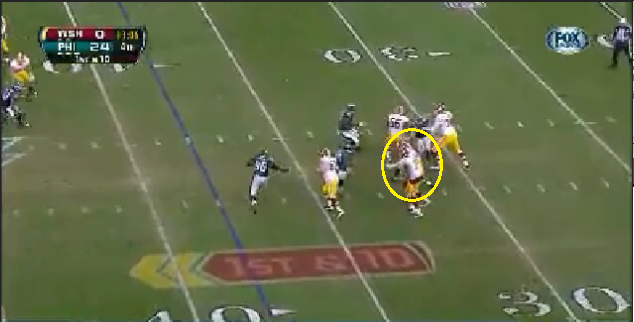 Where he didn't look healthy was everywhere else. He has taken a beating almost every game he has played this year. 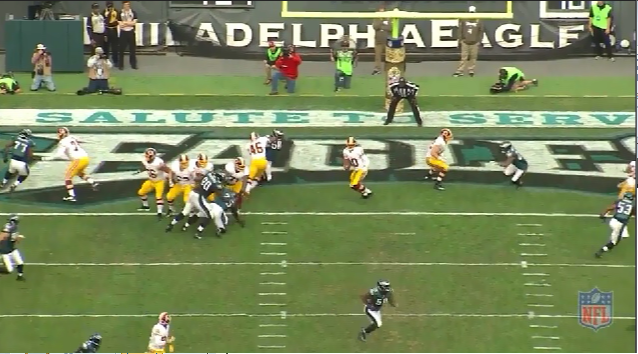 I've seen this happen to other talented quarterbacks: after too many hits they get shell-shocked. They start anticipating the rush rather than anticipating throws. Thankfully Griffin isn't there yet. 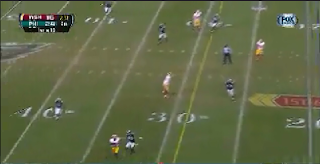 But I don't doubt that defenders can sense his hesitancy in the pocket. 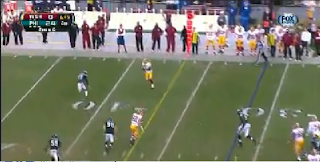 The Redskins need to change their passing scheme before he really does get hurt. 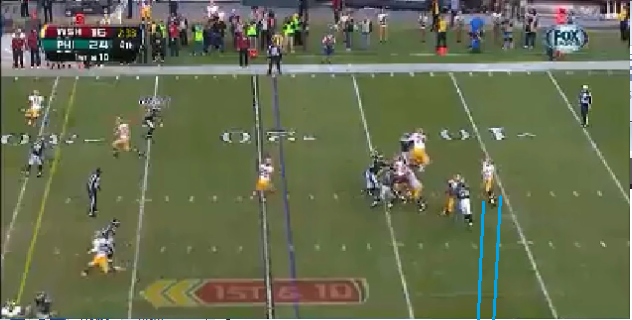 Before the season, I believed that RG3 was the best QB of the young bunch including Luck, Wilson, Kaepernick, and Tannehill (ok, not really Tannehill) that took the league by storm last year. 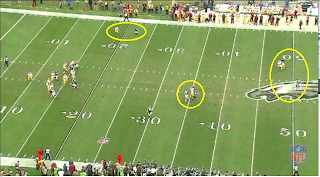 More than that, I thought he had the highest ceiling as the guy with the best fundamentals and physical tools. 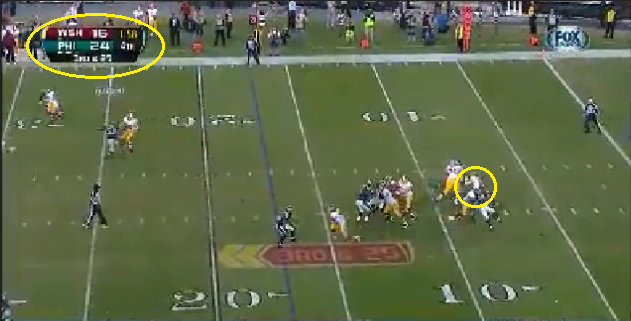 While Luck and Wilson may have surpassed him (and I'll analyze them later), I still believe he can be that special. He needs a coach that will protect him. 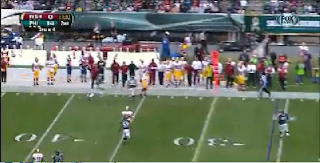 And he needs to take a step back from RG3 and be Robert Griffin for a while. I think the hype hurts him. 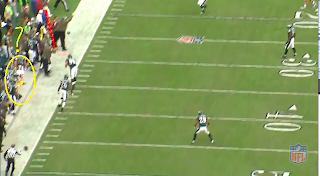 I think the expectations make him want to hang in the pocket a little bit longer so he can make that long pass. I think he needs a coach that will grow with him rather than one that is coaching to make the playoffs, to save his job. 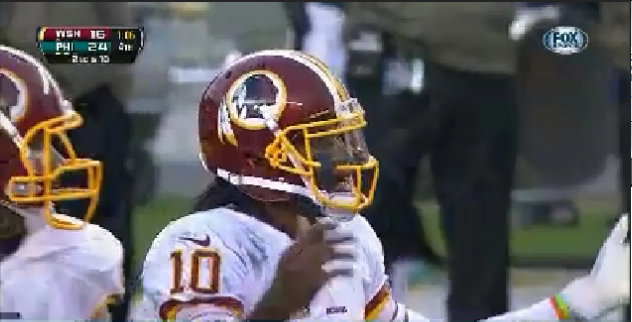 RG3 will be back in the playoffs. 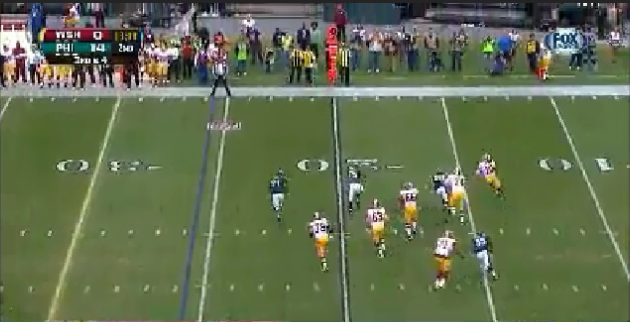 Don't worry, Washington fans. Just let him be himself and be patient with him until he becomes the elite player he's shown flashes of.